Bil’in citizens went out after the Friday pray to participate in the weekly demonstration, were a group of international and Israeli are joining them. Demonstrators hold up the Palestinian flags and banners against the wall and the occupation, land confiscation, siege, killing people and children in addition to the night arresting. 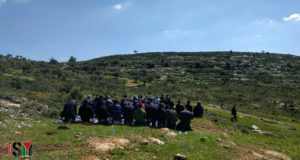 The gathering was at the center of Bil’in toward the wall, where also members of the Palestinian popular struggle front participated in the demonstration. Thus, they are celebrating their 42nd anniversary. Mr. Ghazy Nabali a member of the front party, has expressed his support to the popular struggle, against the land confiscation, and building the wall and settlements. 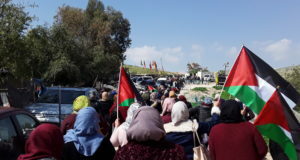 The demonstrators were able to reach the wall area, shouting against the wall and the Israeli soldiers who are shooting the Palestinian and attacking the village at night. The demonstrators were dressing a plastic dresses, hats, gloves, and masks in order not to be affect by the chemical water with a very bad smell that the Israeli are using now against them. The Israeli soldiers started to spray the dirty water by hoses, where the water mixed with chemical and biological materials, which make it smells very bad, furthermore demonstrators started to throw up because of using this stinky water. The Israeli has used this dirty water before one year, then they stopped using it after the intervention of international human rights organizations. Before that, the Israeli have used colored water mixed with gaz. In addition to new weapons such as different kinds of the tear gas, live bullets, scream, sponge, salt balls, and green beans bags, which all-new names for dangerous weapons. On the other hand, the popular committee condemns the continuous attack against the activists through the nigh arresting, which is targeting everyone participating in the demonstration against the wall. While the Israeli soldiers attacked Bil’in village last night, to arrest Muhammad Abdel Fatah Burnat (21 years). and Basel Naeem Burnat (19 years) next to the checkpoint near Bil’in, and Tamer Omar Khateeb (23 years), on his way to Jordan. The arrested people were moved to the detention center in O’ffer close to Rammalah. Within the last three weeks, 16 were arrested including one Israeli and one American. From the other side, the military Israeli court in O’ffer released the activist Adeeb Abu Rahma, with a condition of paying a 10, 000 NIS, while the military administrative refused the court order and asked to keep him in prison. Given that Abu Raham was arrested last Friday’s demonstration.